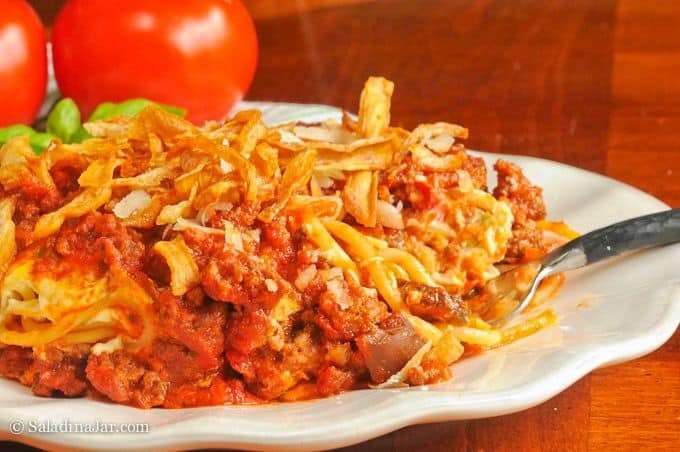 Scooter's Spaghetti with French-Fried Onions • a family favorite! 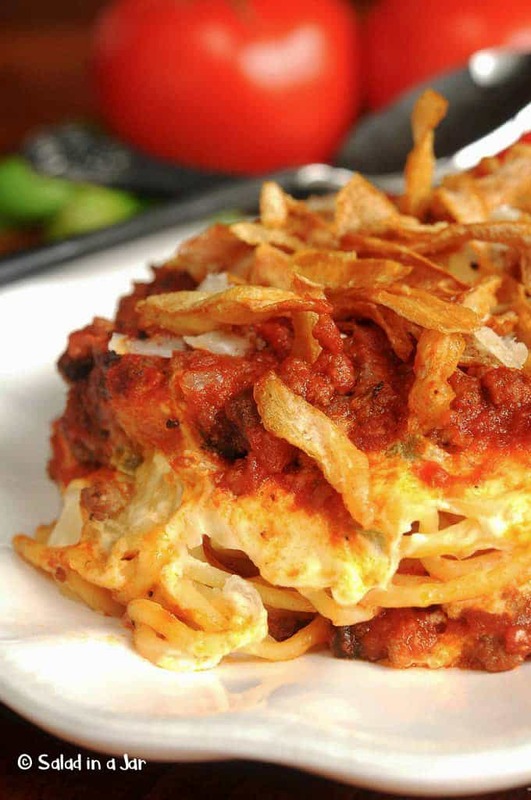 Scooter’s Spaghetti with French-Fried Onions is a one-dish masterpiece your family and guests alike will enjoy. 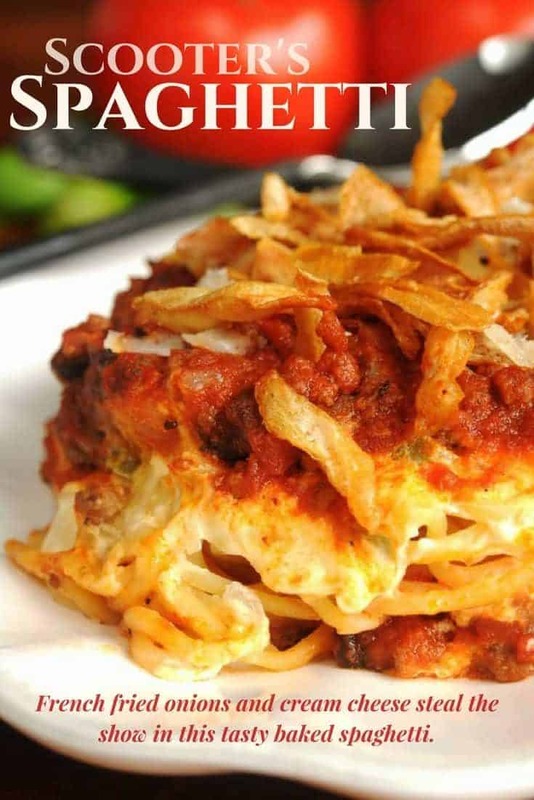 French-fried onions sprinkled over layers of spaghetti, cream cheese, and flavorful marinara make a dish that, honestly, is hard to stop eating. What kind of recipe makes your all-star list? Recipes you can make ahead of time get bonus points. When you make this, you will see that Scooter’s Spaghetti with French-Fried Onions fulfills all these requirements. Scooter is one of my favorite people from way back who is an awesome cook. I’m so happy she is willing to share recipes. If you like this one, you should definitely check out more of her recipes here, here, and here. Speaking of sharing recipes, what is your opinion on the matter? Although I used to be reluctant in an earlier stage of my life, I have found sharing a recipe ensures a memory of you every time the recipient makes it. Hopefully, you’ve written the measurements down correctly so the memory will be a good one. Case in point, I recently ran into somebody I had not seen in 30 years. Unfortunately, she was completely forgotten to me. But she remembered a recipe I had given her. In fact, she claimed to still make it. When she told me what it was I couldn’t place it. Guess it was a fleeting experiment for me. Prepare 8 ounces spaghetti according to directions on the package. Drain and set aside. 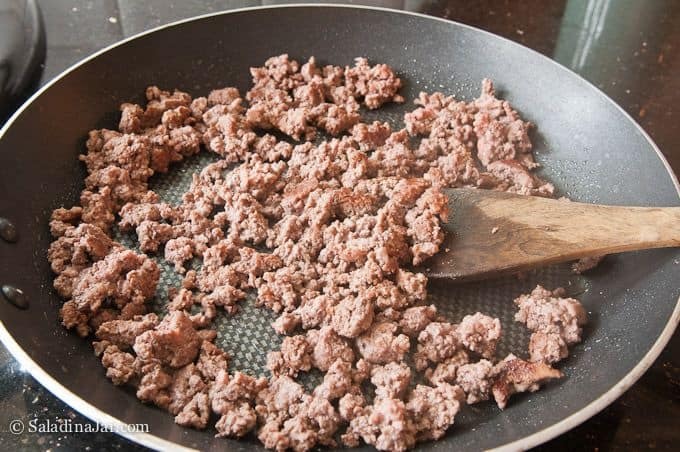 Brown ground beef in a large skillet. Drain excess grease if necessary. 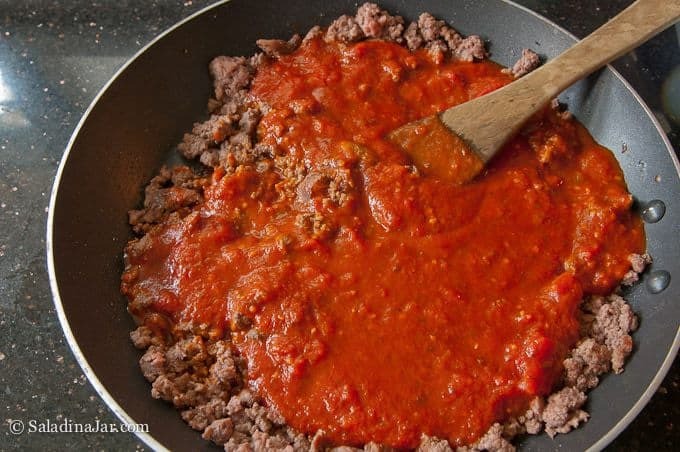 Add spaghetti sauce to ground beef and heat on medium-low. 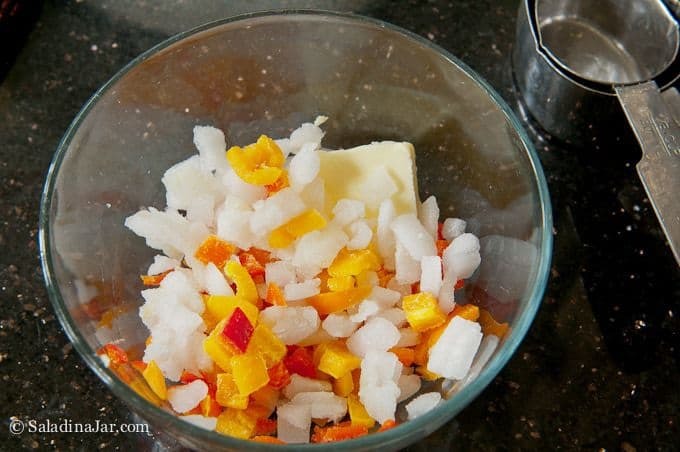 Combine butter, peppers, and onions into a microwave save glass bowl. Cover. Microwave on HIGH for 3 minutes. Add softened cream cheese and milk. Stir until smooth. Fourth layer: Parmesan cheese (I use about 1/2 cup). Bake in 350 degrees F oven for 20-30 minutes or until sauce is bubbling and heated through. In the last 5 minutes of baking, sprinkle French-Fried onions over the top. Put casserole back into the oven until onions are toasty. Keep your eyes on it. The onions can burn faster than you can answer the door. I think of you every time I make Scooter’s Spaghetti with French-Fried Onions, which is really often since we all love it so much. My hips are not quite as grateful as my taste buds. Ahem! Layered spaghetti casserole topped with French-Fried onions is a family favorite! Brown ground beef, then drain excess grease. 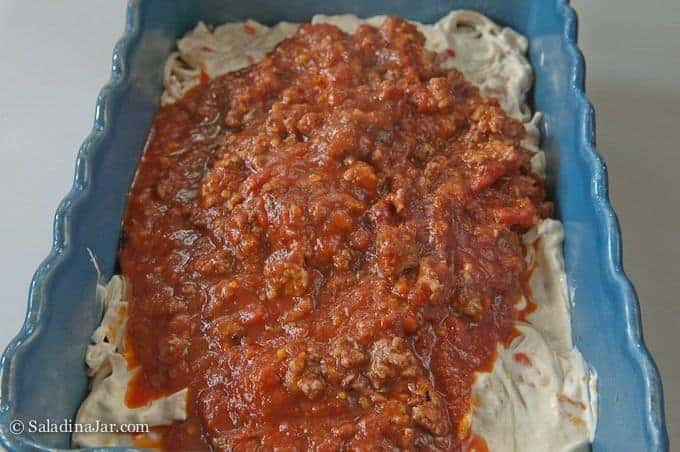 Add spaghetti sauce to ground beef and heat. Make this ahead of time and refrigerate or freeze without the French Fried onions. Don't forget to add them 5 minutes before casserole is finished cooking. Thank you SO much for this recipe. I’ve been using it for years, it NEVER disappoints & everyone loves it!! It’s my #1 go to recipe for any function or family get together. LOVE it!! Thanks for coming back to say so, Jamie. You’re the best! This is such a crowd pleaser- thank you! Would love your help with how I would reheat if I froze one. Thank you so much! First, don’t put the French-Fried onions on the top if you know you are going to freeze. 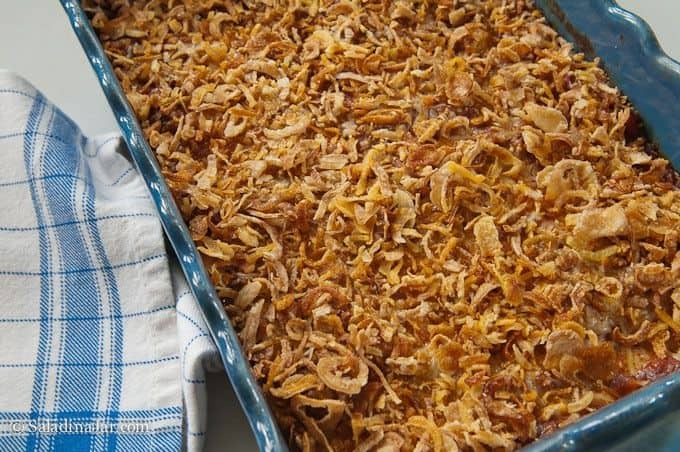 When I pull this casserole out of the freezer, I just zap it in the microwave to thaw, add the French-Fried onions and bake about 5 minutes to crisp and brown them. Alternatively, you could place frozen spaghetti in the refrigerator to thaw overnight, then put in the oven to bake 20-30 minutes until bubbly, then add French-Fried onions and bake for 5 more minutes. Does that help? I can’t wait to try this…sounds like it would be a good one to take to church meetings. Made my mouth water! Thanks so much for sharing! Yes Marilyn. Not only is it good for church meetings, but also for taking to people you may be helping with prepared meals. You recip, Scooter’s Spaghetti just had to be made! I tweaked it little bit. I have to have garlic. Made a double batch and you don’t need 16 ounces of Spaghetti. Doubling the other amounts worked! It really doesn’t matter where are placed. When you take a bite the tongue will want more! We vote on recipes and this is a 9. Glad you liked it Susan. We are enjoying it with zucchini noodles these days. I made this yesterday with zucchini noodles I made with a spiralizer. Also used fat free cream cheese. It was delicious. Both my husband and I loved it. I have done this too and we also loved it. No need to add another vegetable to the menu which is also a plus. Thanks for writing. Hi there! New to your site and really like it! I just made this and improvised with egg noodles instead of spaghetti as I was out and half diced tomatoes and half tomato sauce. I may add garlic and more spices next time. Any reason why you don’t spice it up more? Thank you for a great recipe! I am a recent college graduate who just moved to Japan. I decided this would be a good time to start trying to cook things since I am living on my own. This was amazing! I had several friends try and we all loved it. Thank you for sharing! I attended a Thanksgiving Dinner at my daughter, Kelley’s house. I took Scotter’s Spaghetti Casserole. It was delicious and different. We will make this again. Thanks for sharing this recipe with us. Thank you for a great recipe! I made this for my boyfriend and he is OBSESSED! He requests it all the time. I was wondering if there are any substitutes for the cream cheese?? I’m not a huge cream cheese person but he loves this recipe so much, I was hoping to find a good substitute. Can I use ricotta maybe?? I don’t think ricotta would be the same but it might be good on its on merits. To be honest, I haven’t tried anything else. So this is my second time making this recipe and since we’re not huge fans if peppers I’ve omitted them both times. However, the first time I subbed sweet italian sausage for the ground beef and topped it with a layer of mozzarella. Of course, my Hubby said it needed more kick to it. I also noticed that even with using the appropriate amounts of sauce, noodles, and other ingredients, the dish was quite literally overflowing. So this time I cooked a pound each of mild and sweet italian sausage, omitted the mozzarella and just used the Parmesan. Used a 9×13 Pyrex dish, and a little extra sauce. Turned out fabulous! Interesting idea, Kim. You must be a pepperoni lover. how can I get the nutritional facts on this? My friends and I have decided to start a monthly cooking night at my house and this was the first recipe we tried, needless to say started the monthly ritual off with a bang!! This was sooo good, and it was also so simple to make. They each took some home for their families and it was a big hit with everyone at home as well, thank you for the great recipe!! This recipe is great! I love the french onions on top! 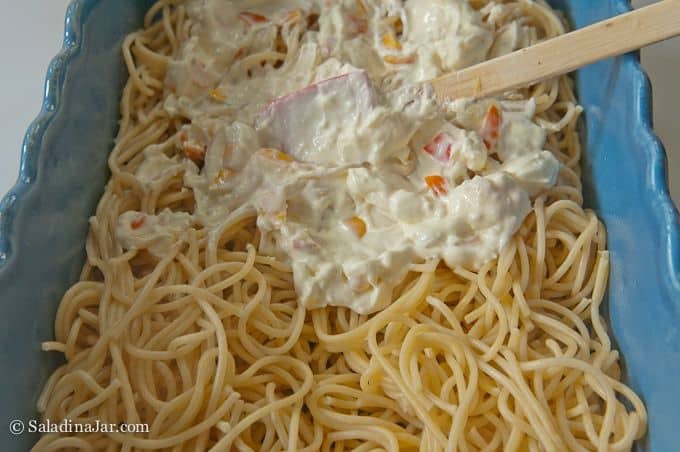 I actually make a similar type dish i call spaghetti caserolle which has been passed down in my family and i do it a bit differently but mixing this recipe with mine came out fantastic! I f anyone is interested in trying my twist on it, it is quite simple. 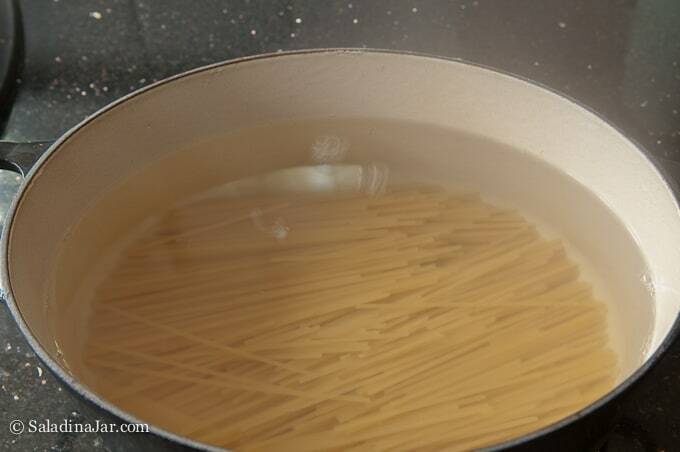 I cook the spaghetti in salt water, once it is done i put it on the borttom of the baking dish. Meanwhile i brown the beef with garlic salt, minced or freshly chopped onions and skme salt and pepper and a dash of italian seasoning. Once browned i put in my favorite sauce ” bertolli roasted garlic and olive oil” and let it simmer a few minutes. While sause is cooking , i spread sour cream and cream cheese on top of noodles and make sure they are coated well with the mixture. Then i pour the beef and sause on top. Then sprinkle mozerella cheese all over the top and then add the french onions. This recipe was amazing! Thank you so much for sharing it! spaghetty looks good but , there is two different directions for layering. do you put the spaghetti first or the sauce ? Made this last night and it could easily be one of my new favorite meals. I substituted crushed croutons for the french fried onions and didn’t add the oninons to the veggie mixture but it still tasted fabulous. I will def be making this again. i just pulled this out of the oven and i’m waiting for the garlic bread to cook…. i used a spicy arrabbiata sauce and a lb of ground beef….lots of onion, basil, garlic and salt and pepper. i shredded the onion and green pepper which created lots of yummy juice (and my family doesnt like chunks of onions or peppers) and i also added halved, large black olives to the cream cheese mix. i added a generous layer of mozzerella and then a TON of parm cheese. i used a large can of the french fried onions and crushed them before sprinkling them on…..omg i cant wait to eat this!!!! Excellent recipe, whole family raved. It’s a keeper! Found this recipe via pinterest! I’ve been thinking about it for months — waiting to move in to our new house (beautiful kitchen!). Thanks for posting this! As a newbie to the cooking world, I found this easy and delicious! Holy Cow! This recipe is amazing! Most other baked pastas seem dry to me, but the cream cheese in this does the trick! Thank you! I made this last night with spaghetti squash instead of spaghetti . It was so yummy! Thanks for the recipe! I made this tonight for our family dinner……there no left overs. It was awesome. Thank you so much for sharing! You are one creative gal. Way to go and congrats on your weight loss. I hope others will be inspired to try modifying their favorite recipes, including this one, when it is appropriate and/or necessary to cut back. Thanks so much for taking the time to share your method. My husband and I loved this dish. I did add a small can of sliced black olives and a small can of sliced green chili peppers to the vegetables. I will defenitly be making this again. I made the Scotter’s Spaghetti tonight and it is definetly a keeper. My husband loves it!! I did add black olives and diced green chiles to the vegetables. Since there is only two of us we did freeze the remainder of it. Love your additions. We are eating leftovers of this spaghetti right now–and enjoying it immensely. 🙂 Thanks for writing. I made this recently and mine came out a little dry (the noodles)…the spaghetti/meat sauce and cream cheese mixture just stayed on top of the noodles during cooking when I thought it would ‘melt’ through. The taste was great… made the mistake of omitting the green peppers (and next time I would probably double the cream cheese mixture.) I would make this again but would probably mix the noodles in with the spaghett/meat sauce before cooking. 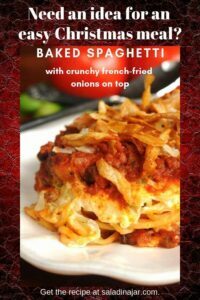 The addition of the french-fried onions really made this recipe! You might try fewer noodles or add one small 8 ounce can of tomato sauce to the meat and spaghetti sauce. This will make it saucier. I have a thought about mixing up the sauce with the noodles before you cook it. 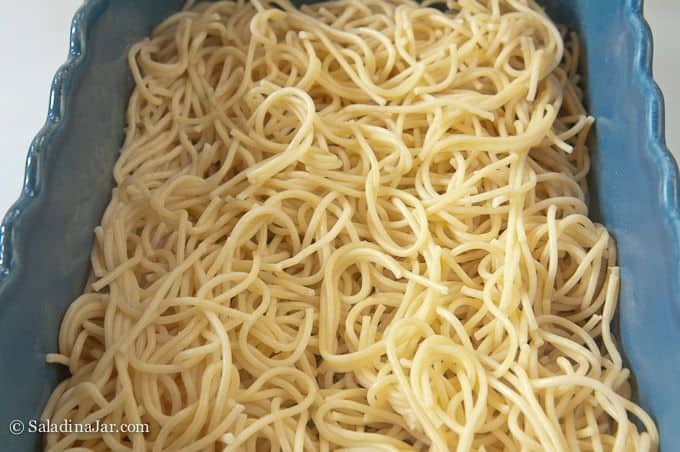 The noodles tend to absorb a lot of moisture and become soggy. The cream cheese layer helps to prevent this– making it superior to most baked spaghetti recipes, IMHO. It all gets mixed up when you eat it anyway. Suit yourself, of course. And yes, the French fried onions make this recipe. I couldn’t agree more! Thanks for writing. This is one of the best recipes I have tried in YEARS!!! I have already made it several times and everyone loves it!! Thank you for sharing. This will be a favorite of mine for years to come!! I make this at least once every 2 weeks and it has become one of my all time favorite meals! I was never a huge fan of “normal” baked spaghetti, but I thought I’d give this a shot! It was SO worth it! It is one of my brother-in-law’s favorite meals now also, (I have to call him every time I make it!) and my picky husband even loves it (as long as I leave out the green peppers!)! Thanks so much for the recipe! YUM! I made this recipe as read except for the meat, I am a vegetarian. I will say very good, and very rich! yum! Just searched Pinterest for this recipe .. wow, lot’s more folks LOVE this. Look forward to giving it a try. Ymmy we had it tonight and it was amazing. thank you! i just made my own sauce concoction bc i didnt want to run to the store. And i used a yellow pepper for the same reason. Thank you!!!! I like yellow peppers better than green so I’m sure I would have liked your version. Thanks for writing. I would like to make this ahead and freeze this to give to my parents. Would you please post instructions on how you would do that? Thank you. I would like to be on your Christmas list. To freeze the casserole, follow the recipe right up to the point of baking it. DO NOT put the onion rings on top. Cover and freeze. It can be baked straight out of the freezer but the time will probably be double. Keep it covered with foil until the last 10 or 15 minutes so it won’t dry out. Add onion rings over the top in the last 5 minutes. Another hint: You might want to add an extra 8-ounce can of tomato sauce to your original sauce because ALL pasta absorbs liquid as it sits and since yours won’t be baked immediately, this will help to keep it from getting too dry. I am freezing it so my roommate and I don’t starve during finals week so thank you for helping a couple of law students eat well during exams! Have both vegetables at 1/2 cup. Also, add an extra small can of tomato sauce. The first time I made this I wasn’t too into it. When I made my changes it was fabulously perfect. It was great! I made a double batch. Had one for dinner and froze one for another day. Kids and husband loved it. I did use light cream cheese just so I felt a bit better. I am making this for about the billionth time. I have gotten very comfortable with it and have done some fun variations with whatever I have in the house. This week I am going to go carb free with it and try it with spaghetti squash! A little nervous about it, but I will let you know how it goes! Can’t wait to hear bout your experiment. I have some spaghetti squash in my fridge right now and I’m not sure what to do with it. Maybe your idea is the answer. this is not a recipe I would recommend…..very cheesy and blah taste. Won’t be making this again. Tried this receipe tonight. I can not believe how amazing this tastes! I will be making this over and over again!!! Have you ever made this in the crockpot? I have a potluck at work and figured it would stay warm if I put it in the crockpot instead of baking it. Of course I would heat up the French fried onions in the oven and put the on once ready to eat. Yes, I have. Same situation as you. It doesn’t look as nice but still tastes fabulous. Try it. This is by far the best spaghetti recipe, EVER. The only thing I added was brown sugar to the sauce, my husband and I love our’s with a little hint of sweet. I will never eat ‘plain’ ole spaghetti again!! Try this, you won’t be sorry! Think I would like that little bit of sweetness myself. Will try it next time.Thanks for taking the time to write. Hi. I was hoping to make this for a ladies’ bunco night. I would love to make it the night before and refrigerate. If I do that, how long do you think I need to bake it? I am sure it will be longer since it will be cold to start. Thank you for your help. I would think at least 45 minutes–covered for most of that time so it doesn’t dry out. This is a great make-ahead recipe. Yummy! Made this tonight! I used sweet italian sausage instead of hamburger and red pepper instead of green pepper. Scrumdilliupcious!! I almost always do the same with the peppers but haven’t tried the sweet Italian sausage but I bet it was wonderful! Made this and it was DELICIOUS! Thank you so much for the recipe and allowing me to discover it on Pinterest! I enjoyed it very much but my boyfriend is not the biggest fan of cream cheese, so next time we will be cutting the recipe in half or cutting the casserole up and freezing some portions for later. Maybe you should get a new boyfriend. Just kidding! You will get to enjoy leftovers unlike me. I have to hide the leftovers. I made this for dinner tonight. We loved it! The only thing I will do differently next time is add a layer of sauce on top of the spaghetti then the cream cheese then more sauce. Other than that it was perfect!! Ty for posting!! That’s an idea. I would think it would be hard to spread the cream cheese on top of the sauce but maybe you can just drop it in spoonfuls. Glad you liked the recipe and thanks for writing to say so. Maybe I will toss the spaghetti in a small amout of sauce then before adding the cream cheese layer. This sounds great. I just realized I don’t have spaghetti or chopmeat, but I do have rigatoni. Hopefully this will work. Trial and error, forks crossed! I’m making this right now, do I cook it in a round casserole dish or rectangle baking dish? Cook covered or uncovered? Help!! I don’t cook very often!! The shape of the baking dish doesn’t matter. You can bake covered or uncovered. Just takes longer when covered. But be sure to uncover after you put fried onions on top. any pointers on what to do or add if you do not like onions or peppers? Would it taste okay without? It will still taste good. Try it. Love the idea of using cream cheese. 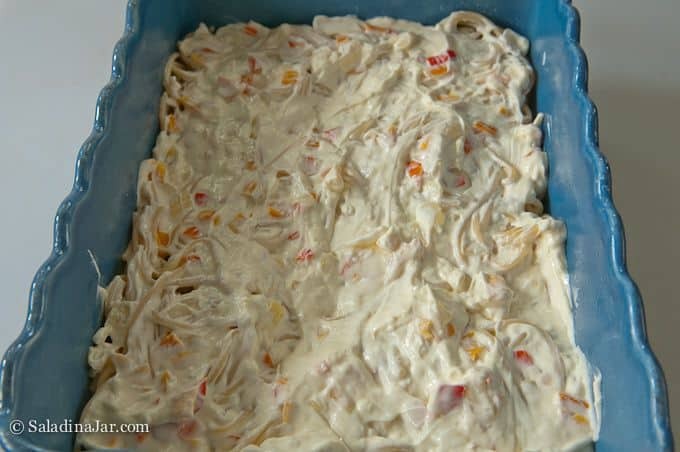 I make a version of this but I use low fat cottage cheese and also add a layer of cheddar jack to make it extra cheesy. I am going to try it your way, cream cheese is my all time favorite food! I made this for dinner last night and it was huge hit. It’s a great easy spin on a classic dish. I personally also skipped the peppers, but added the onion and some cayenne pepper to the meat when I cooked it. I also added diced tomatoes to my sauce to “beef” it up a little bit. I believe Thanks to you we have a new favorite in the house! This looks delish!! Just one quick clarification….you don’t have to cook the spaghetti noodles ahead of time? yes you cook the spaghetti ahead of time. I found this recipe on Pinterest and it has now become a staple in my menu rotation. My family absolutely loves it and I use red peppers instead of green and always add more veggies than the recipe calls for. I am going to do it as a freezer meal now that school and after school activities have started so I can just let it thaw during the day or overnight and pop it in the oven when we get home. Thanks for sharing this fantastic recipe. Made this tonight! Added fresh portabella mushrooms and garlic! It was amazon thanks for sharing!! Portabella mushrooms? Bring it on! Delish! I added sautéed mushrooms to the cream cheese mix. Loved this! has anyone tried it with cornflakes instead of the fried onions? I think I’m going to make this next week (just had spagetti today) and was curious. I have not, but let us know if you like it. Even though I am not a fried onion ring fan, I think they make this dish! Can’t imagine it without them. I found this on Pinterest one day and decided to make it! Im so glad I did. Its my husbands FAVORITE dish. He gets wide eyed and excited every time he sees that Im making it. I LOVE it too, and I dont even care for spaghetti. Ive had a few friends and family eat it and EVERYONE loves it!! Thanks for sharing! That is one of the best things about this recipe. It is definitely a crowd-pleaser. Made this tonight and hubby says this is the way we are having our spaghetti from now on!! It was easy to make and am passing this on to all my family and friends, thank you!! Oh man. I found this on Pinterest and decided I *had* to make it this weekend so I could have dinner for the week. Holy cow! I made a couple adaptions to cater to what I had at home: I used Philly Savor Garlic cooking cream instead of regular cream cheese so I skipped the butter and milk. I also skipped on the peppers. It is DELICIOUS! Can’t wait for leftovers. 😀 Thanks to Scooter and to Paula for sharing! Sure like the idea of using cooking cream. Save time and perhaps a few calories. Thanks so much for writing. I found this recipe on Pinterest we love it! I don’t care much for the onions on top so I chop Garlic Croutons and use for topping so good!! Your substitution sounds very tasty. Thanks for sharing. We made this for dinner tonight! I only gave 4/5 stars because we would have liked the spaghetti to have a little more sauce on it, and the sauce a little less meat, but that might just be personal preference. Next time we are making it with a more flavorful sauce, too, and probably going to try and sneak in a few more veggies (didn’t tell the boyfriend about that addition!) Thank you for a great go-to! Just made this for dinner. OMG. Thank you for thinking of this receipe, genius. 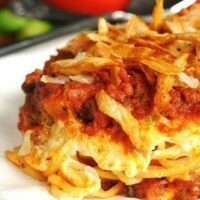 I just made this today and all I can say is this is the best baked spaghetti I have ever had! Thanks for the recipe! Just wanted to say I loved this! We have made it about eight times already and everyone gobbles it up. I use a pound of ground up mushrooms instead of the beef, as we are vegetarian, and it is fantastic that way. My four year old loves to help make the “layers”! Thank you for sharing this one! How many do you think this serves? We often cook for a large crowd from church so we have to make extra of everything! I found this recipe on Pinterest and I have to say………..YUM! YUM! YUM! 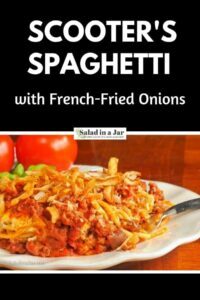 I rarely make spaghetti becuase my husband really doenst care for it, but he just absolutely loves this recipes. And the best thing about it is that it tastes better the next day. And I NEVER eat leftover spaghetti! Have passed this recipe on to other family and friends; just couldn’t keep it to myself! Thanks for sharing! Totally a KEEPER! Amy, we fight over the leftovers of this stuff! I agree that it is even better the next day. We LOVE this recipe! I am actually planning to make this tonight to freeze for later. Do you suggest baking then freezing, or just mixing it all together, freezing and baking just prior to serving? I’m new to this whole “freezer cooking” thing! Im a new email subscriber! I’ve whipped this one up after stumbling across the recipe on pinterest. It’s in the fridge ready to go for tomorrow nights dinner, although couldn’t find the crunchy fried onions here in western Australia. Just wanted to let you know I made Scooter’s Spaghetti for the Crazy Cooking Challenge, it was fantastic! So glad I found this recipe for the challenge! This was great! Had to make it in 11.5 x 8 pan, no way all that is supposed to fit into a 10 x 6 pan. PS- added mushrooms and they went nicely with the recipe! Forgot to mention I left out the vegtables(didn’t have on hand) and mixed cream cheese with sauce, tasted great. Made this tonight, left off the french fried onions, and topped it with pepperoni’s the family loved it.!!! Thanks for the recipe. I LOVE this recipe! My husband told me to make sure I had it in a safe place. He raved about it. My kids enjoyed it too. I did change a couple things. I omitted the onion and peppers and used Philadelphia Pesto Cooking Creme instead of the regular cream cheese and milk. It was delicious!! I froze this. Do I need to thaw it b4 I cook it? I made this for my husband and son. We all loved it! I rarely find a recipe that everyone likes well enough to say “Keep this one” and both made a point of telling me to fix this often. I used a little extra green bell pepper and a bit extra onion. Everything else was by the recipe and it was really good as well as easy ro prepare. It will be a staple for potlucks and to give to new moms, friends that have just had surgury and especially for our family meals! Thanks for sharing! Dirt cake is a combination of crushed Oreos layered with a cream cheese/vanilla pudding/confectioners sugar/whipped topping mix. Unbelievably delicious and with a calorie count to match! I usually make it for large gatherings as it makes a ton. : ) One of my favorite pictures of my daughter is of her with my best friend who is one of my incredible cook friends. They are rolling out pie dough together, my daughter is using a plastic play dough roller…adorable! Enjoy cooking with your little ones, it just makes it that much better. Paula, I saw your comment about recipe sharing and had to share this… I have a spiral bound “recipe book” that a friend bought for me in the dollar rack at Michaels a few years ago. She’s an excellent cook and I was a beginner, so she wrote a few of her recipes in it. I now, 5 years later, have 20 recipes in my cookbook, and ALL are from friends and family. They have names like “Teri’s Chicken and Noodles”, “Grandma Rose’s Snack crackers” and “Auntie Sue’s Dirt Cake”. I am eternally grateful to these gracious ladies who have shared their secrets and their love of cooking with me. It’s a treasure that I will add to forever and plan on passing on to my daughter…who at 2 1/2 loves to cook! Auntie Sue’s Dirt Cake sounds interesting. Assuming it’s chocolate something?? I just started a new blog about recipes and this was my first one! What brand of spaghetti sauce do you use? Made this tonight for the first time, I didn’t have any french fried onions or any peppers so I omitted both, but it was still fabulous! My husband said he couldn’t really tell a difference between it and regular spaghetti, but I could. I will definitely be making again! Thanks! I’m so glad I found this on Pinterest. I’ve been looking for a spaghetti recipe for a cooking challenge but wanted something different. Based on all the comments, I’ve found my recipe, can’t wait to make this! This is, by far, the best baked spaghetti I’ve ever made. I cannot wait to make it for a group other than our family. I wasn’t too sure about the cream cheese but that, along with the onions, really make this fabulous! I found this on Pinterest and made it for dinner last night. It was amazing! We will definitely be having this again. I mixed half zesty/spicy spaghetti sauce and half regular and it was perfect. 🙂 You know what? They were actually shredded carrots. Not sure why I said chopped. That might be too chunky. I bought them pre-packaged and had only a 1/4 cop or so left. So I threw them in! I was really looking forward to left overs today. Le sigh. The fam had other ideas! Someone (who shall remain nameless) polished it off. Actually there must have been at least 2 midnight snackers. LOL. Thanks again Paula!! Made it for my family and friends yesterday.Was a huge succes.So delicious and easy to serve. Will be a favorite at our house from now on. I pinned this a little while ago, and it has been re-pinned like crazy!!!! 163 times in just a few days!! It’s totally cracking me up. Guess I’ll have to actually MAKE the recipe and give it a try!!!! Ding ding ding! We have a winner! I made this tonight, then waited for hubby to go get his customary Indian pickle to spice it up (he is Indian, and Italian food is never flavorful enough for him). He RAVED about this dish! No spicing up needed. (I will say….I used spicy Arrabbiatta pasta sauce, and hot sausage in place of the ground beef…but still..). The whole family loved it, and it was easy to prepare. This is a new favorite. Found this on Pinterest, I am always looking for easy make ahead recipes that all my husband has to do is throw in the oven. Getting ready to hit the kitchen right now! Thanks!! Check out #12 on the directions. 25 min at 350. Add onion rings on top and bake 5 mor minutes. Thank you SO much for sharing Scooter’s spaghetti. I found it off of pinterest and it has become a staple in my house for the last month. I make it for all of my friends who have had new borns and for my boyfriend’s mom who recently had surgery. EVERYONE loves it! Its so easy and so tasty! thanks again for sharing! Yummy! My daughter and her 4 children are visiting for the Holidays, so we made a double batch… I really didn’t need to, but it will make for some awesome leftovers! Thank you for shaing the recipe and thank you to Scooter!! Hi Barb, I get so excited when I have leftovers of this stuff. I’ll admit to hiding it so I can enjoy for lunch at work. So glad to hear you liked it too. thanks! made this tonight (via pinterest) & it was SO YUMMY! made this last night for my family! This was SOOOOOO GOOD! I added mushrooms to the veg mix and cooked with butter and garlic on the stove then mixed with the cream cheese. we WILL be making this again! I found this on pinterest and i’ve made this three times already..this is my family’s new favorite spaghetti recipe! The only change I make is to mix the pasta, veggies, and meat mixture together and pour into a casserole dish. Just easier for me. Thanks to Scooter for creating it! Can’t wait to try this, it looks super yummy! Thanks for pinning!! Made this for my daughter and her family – huge hit with everyone especially the 2 year old! It is now on their Favorites List! Thank you so much for posting this – and thanks to your friend Scooter for creating it! making this tonight. my little one loves to help in the kitchen, and she will love helping with the layers! thanks! will update and let you know what we think!! Made this tonight and it was delicious! I could have eaten the cream cheese mixture by itself! Thank you for sharing this wonderful recipe! Just for ease of reading the recipe I would change the “spaghetti sauce” step to “meat sauce” as it was referred to earlier in the recipe. 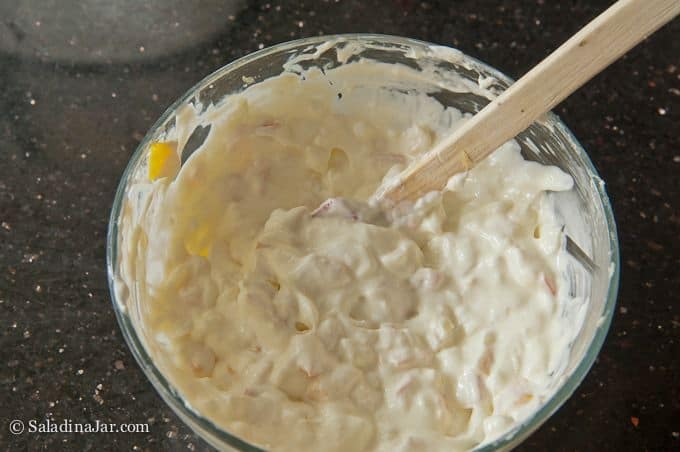 I would also make sure your cream cheese is softened because the heat of the onions is not enough to melt the cream cheese when mixed together. I used an 8×8 dish and it fit perfectly. I didn’t add green peppers or french fried onions and it was very good. I will definitely make this again. I made this for dinner tonight and it was a hit! Love the fried onions on top for that little crunch. All I added as an extra was basil and oregano to to the sauce and a bit to the cream cheese mixture. After letting it set for 10 minutes it held together like a lasagna when dishing up. Will make again!!! I made this last night and use fake beef crumbles to make it vegetarian and it was sooo good. Had it again for lunch. Yum! This was SOOOOO good! We are vegetarians, so I substituted 1 lb baby bella mushroom chopped for the ground beef. It was heavenly! Definitely love this…but is there an easy way to mix the cream cheese with the veggies? It’s so awkward! I have made this two times. My daughter loves it. I added some garlic salt the second time as I thought it was a bit bland but that is probably due to the brand of sauce I used. A big hit regardless!! Oh how my husband loves those fried onions! I showed him this recipe and he can’t wait to try it! This was awesome!! Thank you!! What size pan would you suggest for the spag if I don’t have a 10×6? I made it in an 8×11 and it worked fine. Making this for dinner tonight! I’m so excited to try it! First recipe of yours I’ve made thanks so much for posting this!! Soooo Good! Made this tonight for my family. Rave reviews. Will definitely make again! Thanks for the recipe. Ok, so I was telling my husband about seeing this recipe on your blog and he was really excited about it. He usually cooks dinner during the week because of our work schedules and he actually made this this spaghetti. It was really, really good. He said he’ll be making it again. Thanks for the recipe! I made this for dinner tonight. It was super tasty, and not to mention, quick & easy! Nelena, Thanks for coming back to say so. This is definitely one of my very favorite recipes. Now that’s what I call some serious comfort food! Awesome! I don’t check your website often enough – I am having to stay up tonight to wait on a cheesecake that is cooling – I won’t share the recipe – because it doesn’t meet your requirements – way too much effort and time – but boy does it taste good. I thought I would share with you our favorite Salmon Recipe – it’s one that we’ve had for Christmas the last several years. Try it and give me your opinion – Would love to see you some time – the next time I’m over your way – I’m calling and scheduling some time with you and Billy. Lightly brush the fillets with the olive oil and season each on the flesh side with 1/2 t. Essence, and 1/4 t. of the remaining salt, and pinch of the remaining white pepper. Add to the grill, skin side down and cook until the skin is crisp (4-5 minutes). Turn and cook until the salmon is opaque and medium-rare (about 4 minutes) depending upon the thickness of the fillets. To serve, lay the asparagus fillets down the center and place the fillets of salmon on top. Spoon the cool or cold relish over the fish and serve immediately. We like the warm asparagus and salmon with the cool relish. Yum! I think I need to make this next week sometime!! this was quite fun to log on and see that I made the blog. I am thoroughly enjoying the tips. I check the blog just about every day and then scour the grocery stores to check them out for myself. So far…….love the gnu bars, smoked sundried tomatoes and fage greek yogurt! I was hoping you would see it! Ok if I put up the almond chicken one of these days? Love that stuff too. Scooter! I cannot tell you how much we love this recipe, and how many times I’ve made it. Thank you SO much! Just today I took a pan of it over to the home of a friend who has cancer. Her daughter texted me, raving about it, and asking me to please, please make it again, even if only for a church potluck or something. 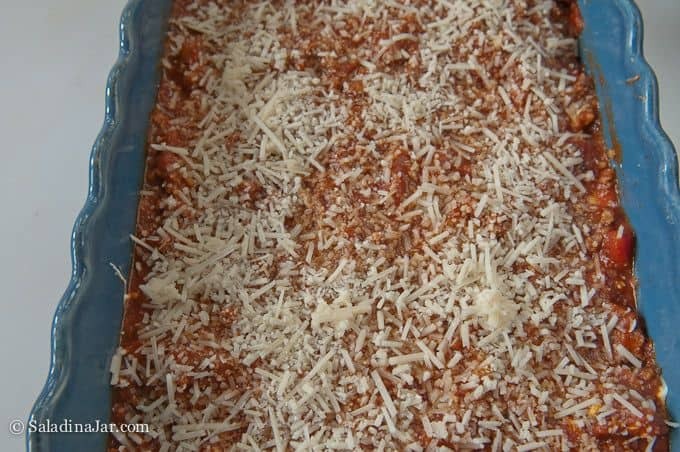 I have made it for our church home group meetings, family gatherings…..I always make two pans of it (one with ground beef and regular sauce, another with hot sausage and spicy arrabbiata sauce), and then we have leftovers for another night later in the week when we are all running different directions. It is my go-to recipe, all thanks to you!